Former Houseguests Jeff Schroeder and Jordan Lloyd came back to the Big Brother house last night to host this week’s Veto Competition. Meanwhile, the battle between Rachel, Brendon and the rest of the Houseguests continues to escalate. On the last episode of Big Brother 12, Matt won Head of Household after another endurance competition. He also opened Pandora’s Box, winning the Diamond Power of Veto and setting loose a new Saboteur in the house, Ragan. With the Diamond Power of Veto, Matt can take anyone he wants off the block the next two weeks and replace them with whoever he likes. On Big Brother last night, we drop into the house just after Matt nominates Rachel and Brendon for elimination. Rachel complains in the Diary Room that she can’t believe she has become the bad guy in the house. Brendon thinks everyone will go after Matt next week because he nominated them. Brendon and Rachel demonstrate once again that they don’t seem to have an entire brain between the two of them. Big Brother 12 Houseguest Annie Selling Show Props? We are always on the lookout for anything interesting involving Big Brother out there for sale. This week we found something nifty on eBay.com that might be a fun buy – if it is actually real. If it isn’t, well, it is a creative way to make a dollar off the Big Brother name. If it is real, but the person selling it doesn’t have approval to use the Big Brother name and sell props from the show… well, that would be interesting. 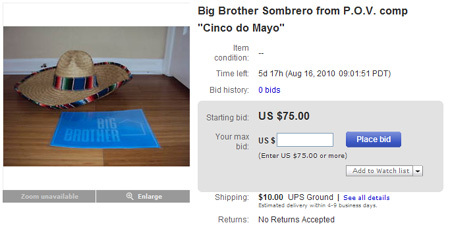 The auction on eBay is titled “Big Brother Sombrero from P.O.V. comp “Cinco do Mayo” [sic] and is listed by a seller by the handle annie_bb12. Now, this seller’s name is quite close to eliminated houseguest Annie Whittington‘s Twitter profile name. Also, the auction supposedly originates from Tampa, where Annie lives. However, the seller has no previous auction listings and there is no verification this is the actual Annie from BB12 or anyone who knows her. In the competition, seven Houseguests will have 45-seconds to roll 16 bowling balls, hoping to strike down ten bowling pins that are stacked on top of each other. After each player bowled in a round, they will then challenge one of the other eligible Houseguests to knock down more pins. Whoever knocks down the most pins, and stays in the game until the final bowler remains is crowned this week’s Veto holder. After a late night involving plenty of drinking, bitching and game-playing, the Big Brother 12 Houseguests are finally roused out of bed. Kathy, Enzo and Hayden hang out on the couches sleepily discussing the Big Brother wake up music for the day. Kathy, naturally, smokes it up while they chat. Lane comes out and plops down on the couch too. They talk about how they have to do things together at night so no one suspects they are the Saboteur. Dead silence from the other Houseguests on that one. Brendon brings up the Saboteur and questions whether or not the person might have a special power. Rachel asks Britney if anyone (from BB) told her America voted on the Saboteur. The feeds cut out, as they often do when the Houseguests start talking about things they probably shouldn’t. Find out who won this week’s Big Brother 12 Power of Veto competition and if it was used below! Britney won the Power of Veto but decided to NOT use it. Therefore either Rachel or Brendon will get the boot Thursday night. Brendon threw a huge fit after the Power of Veto Ceremony in an obvious ploy to try to get the other Houseguests to vote him off instead of Rachel. Brendon launched a nasty attack at Britney and Rachel started mock-crying all over the place. Rachel and Brendon believe their little distraction plan worked. The other Houseguests, of course, aren’t falling for that crap. We just can’t believe Brendon is stupid enough to try to get himself eliminated over Rachel. You know that girl is going to drop him like a hot potato once they are out of the BB house and try to move on to bigger fish! Get your own scoop on what is going on in the Big Brother 12 house 24/7 with a 3-Day Free Trial of the Live Feeds!